How annoying is it when you pick up a book you're in the middle of and leaf through to find your place, only to discover your bookmark has done a disappearing act and fallen out? Not cool. 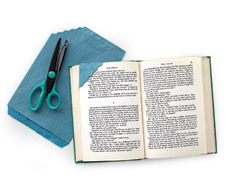 Apparently, it's happened to Martha Stewart one too many times, because she has a handy dandy way to mark your page without relying on (apparently) fallible bookmarks. You simply find a colorful paper bag or envelope, snip the corner off (you can use scalloped scissors or the like to pretty it up), and place it over the corner of the page you want to mark, like a little hat. How clever! I've seen ready-made versions of these (I smell a roundup...), but this is an easy-peasy way to create your own personalized versions. I tip my hat to you, M.Stew. More details here. This one (with tutorial) is an improvement on the M.S version - with magnets!